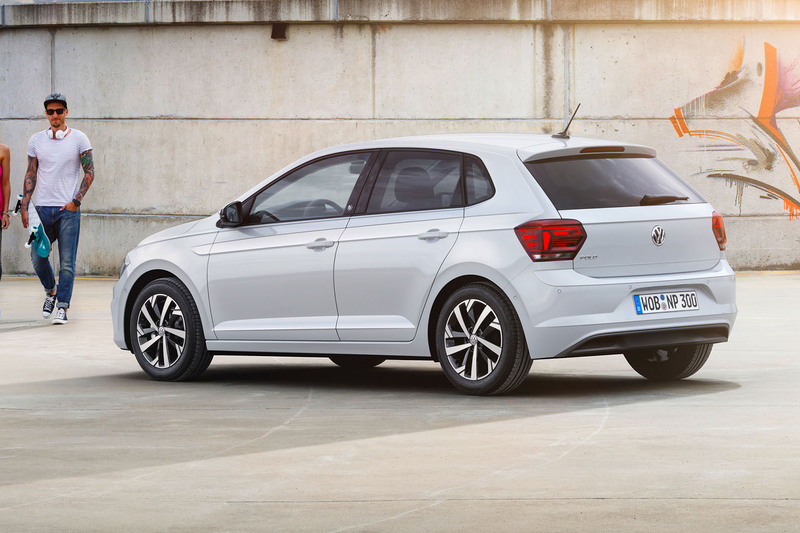 Volkswagen's sixth-generation Polo is now available for order, with prices starting at £13,885 and first deliveries due next month. The new car is an outwardly larger, significantly roomier and more technically sophisticated model than the previous eight-year-old model. VW's 2017-model-year Polo is being produced in five-door hatchback form only, with buyers offered the choice of up to six engines – the most powerful of which endows the range topping turbocharged 2.0-litre four-cylinder powered GTI model planned to see right-hand drive production early next year with a Ford Fiesta ST equalling 197bhp. Key among the compact car competition for the new model is the Ford Fiesta, Vauxhall Corsa, Renault Clio and Nissan Micra. Speaking to Autocar at the car's launch, Herbert Diess, chairman of the VW brand board of management, wouldn't say if he thought that the new Polo could entice buyers away from the UK's best-selling car, the Ford Fiesta, but did say: "I am convinced that we have the most competent car in this segment." 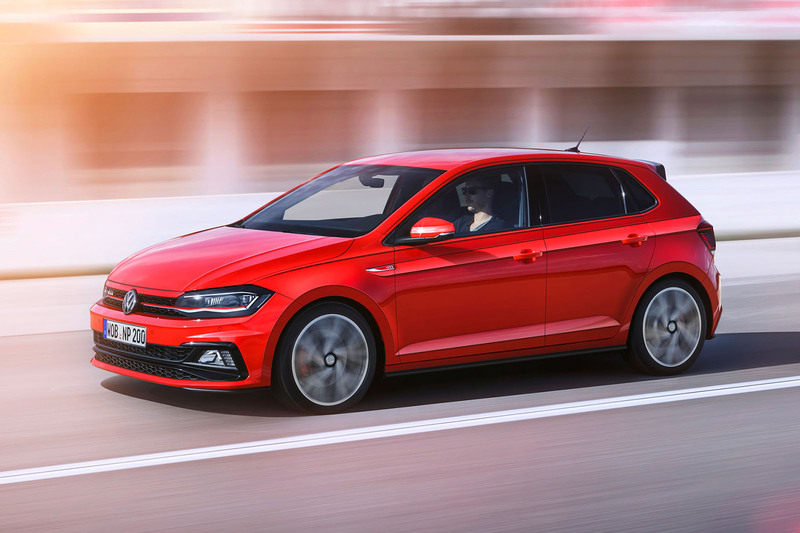 Diess continued to talk about the car's improved handling, particularly in GTI form, suggesting that the new Polo and Polo GTI could challenge the Fiesta and Fiesta ST in terms of handling prowess. Diess said: "All cars normally grow a little, but where the Polo has grown most is in its wheelbase; this adds a lot of comfort but doesn't add a lot of size. The car has become wider and lower, so the car's proportions are improved. It's increased a little in size, but this has been fully translated to the inside; more leg room and a lot more bootspace." At 4053mm in length, 1751mm in width and 1446mm in height, it is 81mm longer, 63mm wider and 7mm lower than its predecessor. Volkswagen has confirmed the 2017 model year Polo will be sold with the choice of four petrol and a sole diesel engine in varying states of tune, although not all will be available at the time of launch. Each receives a standard stop/start function and brake energy recuperation for improved efficiency. Gearboxes include either a standard five- or six-speed manual, with a seven-speed dual clutch unit available as an option in combination with the more powerful engines on offer. Despite developing the smaller version of the MQB platform to accept four-wheel drive, Volkswagen says all new sixth-generation Polo models will be sold exclusively with front-wheel drive in a move aimed at streamlining production and improving profitability, which has traditionally lagged behind its more keener rivals. Among the petrol engines is a naturally aspirated 1.0-litre three-cylinder multi-point injected unit with either 64bhp or 74bhp in a pair of price leading 1.0 MPI models. It is joined from the outset by a more sophisticated turbocharged 1.0-litre three-cylinder direct-injection engine offering either 94bhp or 113bhp in two new 1.0 TSI models. 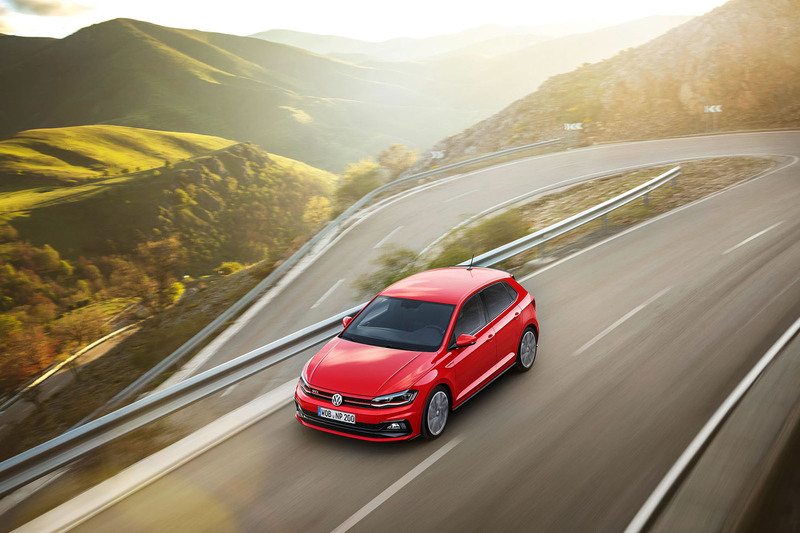 Further up is a new 1.5 TSI running Volkswagen’s newly developed turbocharged 1.5-litre four-cylinder direct injection petrol engine with 148bhp. Topping the line-up is the new GTI. It eschews the turbocharged 1.8-litre four-cylinder direct injection engine of its predecessor for a larger turbocharged 2.0-litre four-cylinder engine direct injection powerplant offering an added 8bhp at 197bhp. Reflecting a waning demand for diesel engines in the class it competes, Volkswagen will launch the new Polo with just one diesel. The carry over turbocharged 1.6-litre four-cylinder common rail unit delivers either 80bhp or 95bhp in a pair of 1.6 TDI models – both of which receive SCR (selective catalytic reduction) converter as standard. Also available in selected markets will be a natural gas propelled 1.0 TGI model running a specially adapted version of Volkswagen’s turbocharged 1.0-litre four-cylinder direct injection petrol engine developing 89bhp. The 2018 Fiesta ST will swap four for three cylinders, but with 197bhp and Ford’s handling know-how, expect big things. The Swift Sport will follow market trends and swap its naturally aspirated 1.6 for a turbocharged 1.4 successor when it lands in 2018. Seat is still deciding whether or not to do a Cupra version of its Ibiza. If it does, it’s likely to use the powertrain of the Polo GTI in a lairier package. Comment: Has Volkswagen's MQB platform finally come of age? Is the next Ford Fiesta really 4407mm in length, if true it makes it bigger than the Focus. Will turn buyers turn to this dull Polo and others. Is the king of small cars at risk of being the joker of the pack? It's a typo; it's 407cm. It's a typo; the Fiesta is 407cm. Still longer than a first gen Tipo or Multipla, and not much shy of the 417cm of the first gen Focus, but not as long as reported in the article. Well, the Polo is 17.5 metres wide, so beat that! Initial reports in Autocar said it would be a 5 door only, then they seemed to change their minds and said it would be available as both a 3 and 5 door. I'm disappointed to discover that it will actually only be available as a 5 door. As to the looks, it's a nice facelift that is all. Slightly less angular, which is an improvement, but it is too big for a supermini. ... Lowered, on big rims. As do most cars. We need to see it in shopping spec. Looks like a Golf .. It may be very different when seen in the metal, but from the pictures the similarities between the new Ibiza and Polo are remarkable. With the exterior, the shape of the DLOs, the stance, even aspects of the body surfacing are very similar. Inside, the architecture of the dash is more clearly shared than has been evident before - in fact at fist glance I thought the two dashes were identical. This may not be a bad thing in absolute terms, but the lack of differential can only do harm to VW Group's brand and pricing structure. Asked to pick between the two, for the first time I'd actually go for the Seat over the VW - I think it's a very handsome thing, the new Ibiza, with a lovely stance and attractive proportions. It must be really frustrating being a young VW designer being told everytime to be less radical & always extra conservative on the next generation of a vehicle. The silhouette of the new car looks exactly the same as the old car. The only real "advance" in design language is the strange looking shoulder treatment & the extra "squared" off instrument panel with those extra large door latches!!!! If VW are scared to offer their customers anything new & different why bother bringing out a new car???? They could carry on just "facelifting" the old Polo & save billions of Euro's!!! If I had to buy a VW, I would sooner buy a Seat or Skoda, they look a bit more exciting!!!! !